InTouch SmartCards presents the Thuraya SO-2510, the new smallest and most compact satellite phone available for any satellite network. The revolutionary SO-2510 is a high-performance satellite phone that can withstand the rugged environments. This Thuraya Tri-Band phone has Bluetooth, Java, USB connectivity, expandable memory, satellite and terrestrial GPRS and enhanced GPS service all with a vibrant color display. The SO-2510 has features for the business minded traveler such as data, fax and short text messages. A unique feature the Thuraya SO-2510 also offers is the retractable antenna into the body, no other satellite phone has featured this option. This SO-2510 is very light making it easier to travel with than other bulky satellite phones. With the pocket fit sized Thuraya SO-2510, satellite phones are no more cumbersome gadgets to carry around. Thuraya SO-2510 offers satellite services exclusively in a mobile handset that is as compact and light as a small GSM phone. As the world�s smallest and lightest satellite phone ever made (weighing only 130 g and measuring 118 x 53 x 18.8 mm), Thuraya SO-2510 has redefined the perception of a satellite mobile phone. The Thuraya SO-2510 is sleek and stylishly designed in appearance - far from the traditionally bulky satellite phones to satisfy the present-day users� demands in taste and convenience. In addition, the small satellite phone is built to sustain the harshest of environment and rugged usage. Catering to diverse customer segments across the world - from a traveling businessman to a reporter to a oil-rig worker, the portable phone is highly user friendly, offers high quality performance and features simple navigation capabilities. Thuraya SO-2510 offers you mobility and a choice to stay connected with Thuraya satellite services in places where terrestrial and GSM communications are unavailable. Smaller in size, the Thuraya SO-2510 is large and rich on features. The phone features include GmPRS, Location Tracking (GPS), Fax and Data at 9.6kbps and SMS - services that allow subscribers to be in touch with the word anytime and anywhere in Thuraya�s coverage area. Thuraya SO-2510 is supported with peripheral products and accessories that complement the phone and enhances usage in both outdoor and indoor environment. Thuraya SO-2510 comes with enhanced memory capability that allows you to save as many numbers as you wish in your satellite phone. The phone supports 12 languages including Arabic, English, Farsi, French, German, Hindi, Spanish, Russian, Urdu, Italian, Portuguese and Turkish. 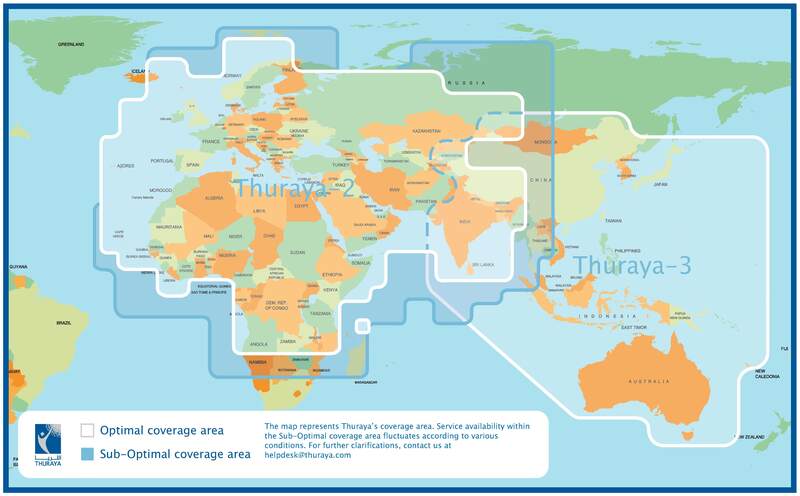 Thuraya Postpaid Service costs about $30 a month, and will range from $0.79 to $1.25 a minute. This will vary based on calling locations and called destinations. Thuraya offers postpaid as well as two types of prepaid services: Regular and ValuePlus. Regular prepaid service call charges and postpaid service are about 25% higher than the ValuePlus prepaid service. If you have any questions call us at 1-703-222-7161 or at 1-800-872-7626 from within the US. Prepaid air-time sold on prepaid scratch cards in $194 (160 unit) increments, extends the validity of the SIM Card for 3 months from the expiration date of the previous refill. This works out to about $1.25 a minute with the Super SIM (for most calls back to the US from Iraq). Most customers buy the original prepaid SIM/Service for $80 and then the Scratch Cards at $194 each. They give you $194 of talk time. *Depends on the operator network configuration and radio access technology used.